The California wildfires still raging out of control are the work of a serial arsonist and not the result of global warming. Yesterday, officials arrested the dangerous firebug accused of setting 17 of California’s wildfires as firefighters battle the still-raging firestorms across the state. Previously, global warming alarmists said the wildfires were a result of the long-running California drought that has left a lot of dry tinder on the ground. Numerous studies have shown the California drought is entirely natural and part of a regular cyclic pattern for the state. The man accused of setting the California wildfires is Damian Anthony Pashilk, who has been arraigned on 17 counts of serial arson. Unfortunately, the fires are still raging and the worst is yet to come. 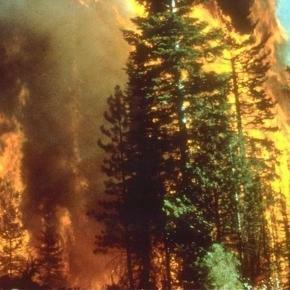 Fireseason for much of California is September through October when ground kindling is at its driest. The wildfire that began as a small brush fire has also forced California into a state of emergency. As of today, the wildfire inSan Bernardino, dubbed the Blue Cut fire, has burned about 18,000 acres and drove 82,000 people from their homes. It was so hot it melted bikes and destroyed thousands of homes. With the ongoing drought, summer heat, and strong winds, there was even a firenado spotted. Another fire, called the Clayton Fire, has wiped out roughly 4,000 acres and 175 homes since Saturday. While many residents are happy that Pashilkis behind bars, he has left a trail of misery in his wake. He has started at least 17 fires across the state, with many of them still burning. Part of a larger picture? Prior to his capture, some people were speculating that the wildfires were part of a larger global warming picture. Some said that the fire season had started earlier this year and blamed it on the drought, high winds, and higher temperatures. But it turns out an arsonist had his finger on the scales. Without Pashilk setting the fires, this likely would have been a normal fire season. Many of the problems facingCalifornia are self-inflicted from decades of fire suppression, a naturally occurringdrought, and mismanagement of water resources. While some have tried to blameglobal warming, studies keep disproving their alarmist rhetoric. Even the Louisiana floods have come under scrutiny as somehow being part of a larger #Climate Change picture. Al Gore, who has fingered every natural event as being related to climate change, has jumped into the fray and blamed the floods onglobal warming. But studies show that the rainfall in Louisiana is entirely normal and also part of natural cycles. Flashback 2015: LA Times: Gov. Brown’s link between ‘climate change’ and wildfires is unsupported, fire experts say – Scientists who study climate change and fire behavior say their work does not show a link between this year’s wildfires and global warming, or support Brown’s assertion that fires are now unpredictable and unprecedented. There is not enough evidence, they say.